Parts of Baw Baw have been included in a severe thunderstorm warning issued today, and the entire region has been given a moderate epidemic thunderstorm asthma forecast. Please note: this information was correct at time of publishing. Visit the BoM website for the latest. Updated 17:20 with asthma info. 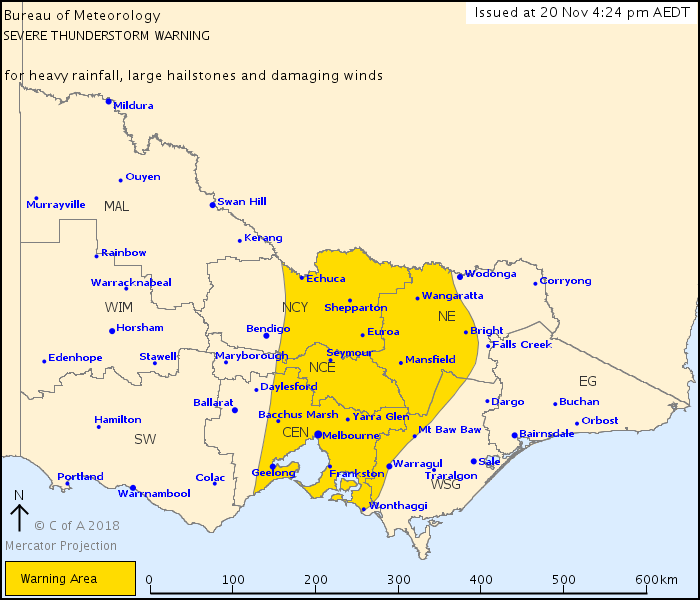 “A 94 km/h gust was recorded at Bendigo earlier this afternoon. “Move vehicles under cover or away from trees. “Secure or put away loose items around your house, yard and balcony. “Keep clear of fallen power lines. “Keep clear of creeks and storm drains. “Don’t drive, ride or walk through flood water. “Be aware that in fire affected areas, rainfall run-off into waterways may contain debris such as ash, soil, trees and rocks. “Be alert that in areas recently affected by fires, heavy rainfall increases the potential for landslides and debris across roads. “Avoid using the phone during the storm. You can find out more about what the forecast means and how to address it by clicking here.